The images you see on Cyclone Center were observed by infrared sensors on weather satellites. These sensors provide an estimate of the temperature at the tops of clouds. Cloud top temperatures are very important because they give us an idea of how tall the clouds are. Temperature decreases with height in the lower atmosphere (up to 10 miles), so cold clouds are taller than warm clouds. Taller clouds are responsible for the heavy rain and thunderstorms that drive tropical cyclones. 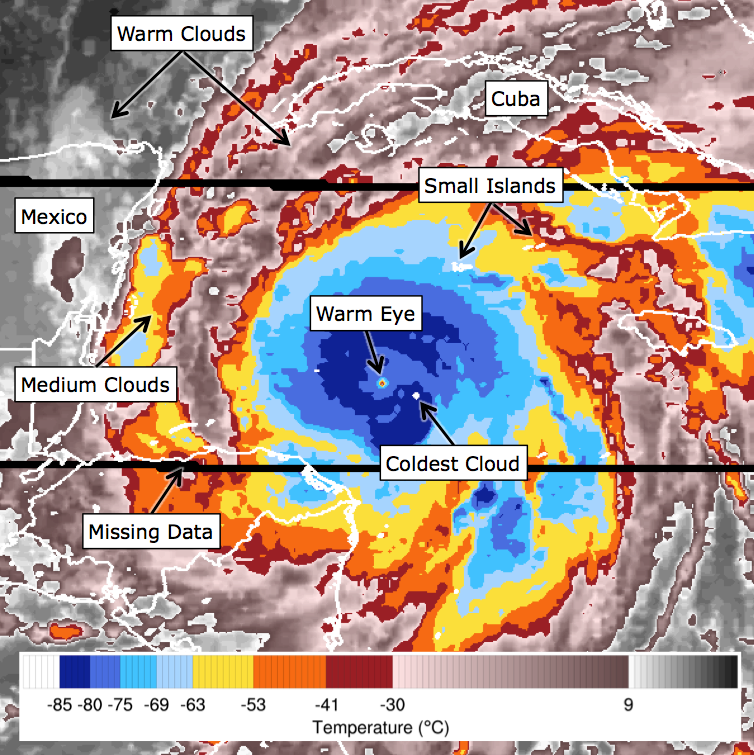 In the Cyclone Center images, the cloud top temperatures are represented by a range of colors. The scale on the image above shows the temperatures in degrees Celsius that correspond with each color. Black and gray are the warmest, indicating temperatures from 9°C (48°F) to 30°C (86°F). Often these will be the temperatures we experience at the land or ocean surface, but they can also be associated with very low clouds. Shades of pink go down to -30°C (-22°F). In our images, these are almost always associated with low clouds. Red, orange, and yellow come next, and they indicate medium-level clouds. In most images, the coldest clouds you see will be shades of blue. Sometimes you’ll even see a cloud that’s so cold it shows up as white. These clouds are colder than -85°C (-121°F). Coastlines and political borders are also drawn in white, so make sure the white clouds are surrounded by dark blue. Otherwise, you might just be looking at a small island. Sometimes there is a problem with parts of the satellite data. These missing data will show up as black lines in the images. Just ignore them and carry on with the analysis when you see them.